I have veneers and have noticed slight staining at the edges by the gums. What can I personally do to help diminish these stains? Will some of the whitening treatments out on the market today help? How a about Listerine’s new whitening wash? I notice you’re saying that the stains are on the edges of your porcelain veneers. The porcelain, as long as it maintains its glaze, is very stain-resistant. But on the edges, you have bonding resin, not porcelain, so that area tends to be more susceptible to staining. There are two possible things that could be going on. This could be just a stain, in which case it probably will need to be polished to get rid of the stain. But it could also be what we call microleakage—there is a microscopic gap here between the porcelain and your tooth, and bacteria are getting in. If this is happening, it is a precursor to decay and needs careful attention. If it is limited, it could possibly be repaired. On the other hand, the bond between the veneers and your teeth may be breaking down to the point where the porcelain veneers need to be replaced. If your staining is at the gumline, my guess is that you are seeing microleakage. During the bonding process, fluid tends to ooze up from your gums, contaminating the bond. 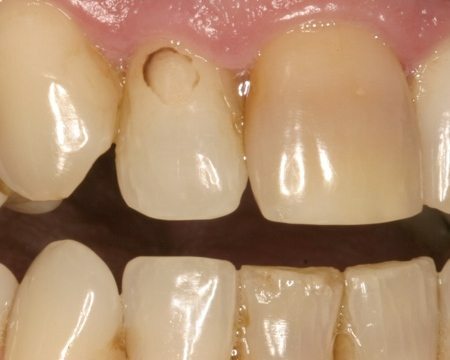 There are techniques dentists use to prevent this oozing while the veneers are bonded, but if the dentist isn’t conscientious with this, they can get this contamination, leaving a weak bond in this area that will begin to break down within a couple of years. To illustrate what this looks like, here is a photograph supplied by Dr. Julie Gillis, our mynewsmile.com recommended dentist in Grand Junction, Colorado. It shows microleakage around a composite restoration on a front tooth. This is similar to what you would see around a porcelain veneer. The leakage we see on the right side of the tooth is minor. What we see on the left is more severe and there is almost certainly decay getting in under this restoration. It is entirely possible that this part of the restoration became contaminated with gingival fluid while the dentist was bonding it. Notice that the areas of the filling that are high and dry—furthest from the gumline—are fine. For a simple stain, the treatment would be to go to an expert cosmetic dentist for a maintenance polish. An expert cosmetic dentist can polish those margins so that the stain goes away and so that they won’t become stained again soon. To be sure you’re getting a fully qualified cosmetic dentist, I’d recommend going to someone on our list. Even if it involves some travel, it would be worth it to save your porcelain veneers. Just make it clear when you call what you want and that you want to do it in only one visit. It should be worth the trip to get them beautiful again. If, on the other hand, it is microleakage, provided it is in the early stages, it could be treated using a little microetcher sand blaster to remove the deteriorating composite bonding material and then rebonding the marginal area. Maybe. Or it may require replacement of the veneers. The edge of the porcelain veneer is its most vulnerable place. The tiny gap between the hard enamel of your tooth and the even harder porcelain is filled here with bonding resin, which is softer. There are several things that can be done to insure the long-term integrity of this area. The first is for the dentist to use careful and correct bonding techniques. Both the surface of the tooth and the inner surface of the porcelain veneer need to be properly prepared so that they lock onto the bonding resin. The resin itself needs to be a high grade material and needs to be adequately cured. There must be no contamination of the bond. I recommend that the office polish these margins regularly. The patient needs to have good oral hygiene here. Daily flossing and regular brushing will help keep these margins clean. Frequent snacking should be avoided. Excessive alcohol consumption will soften the composite bonding resin and cause it to deteriorate prematurely. With proper procedures and proper care, porcelain veneers can last ten or twenty years. When dentists have been sloppy in their bonding techniques, I have seen decay at these margins within a couple of years. Read more about what to do about stained teeth. 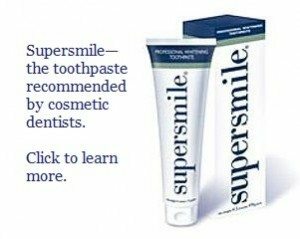 We have some information posted on whitening toothpaste. It’s important to know what whitening toothpaste can and can’t accomplish, so you have realistic expectations. Can I whiten my porcelain veneers? Valerie asks: What can you tell me about Lumineers? Teeth become discolored from substances you eat or drink, such as coffee, tea, berries. Peridex anti-bacterial mouthwash is the worst at causing stains. Read more about maintaining porcelain veneers and other cosmetic dental work. Click here to return to frequent questions about cosmetic dentistry. Can you get a cavity with veneers?